Data from NASA’s New Horizons mission to Pluto are trickling in, but the information that has arrived has already shaken up space exploration and our understanding of the solar system in the best possible way. Excitement over New Horizons, which captured stunning high-resolution images on its flyby—including on July 14, 2015, when it passed within a mere 7,767 miles of the dwarf planet—suggests it may be “the Apollo moment for a new generation,” said Richard P. Binzel, Professor of Planetary Science in the Department of Earth, Atmospheric and Planetary Sciences and a New Horizons mission co-investigator. At public events in July discussing the mission, he saw huge auditoriums packed with people, perhaps half of whom were kids, “dragging their parents to see Pluto.” A September talk in Lexington, Massachusetts doubled the venue’s attendance record—with, as Binzel noted, “a posse of kids sitting on the floor right at the front.” The excitement extends to young adults, people no older than 25, stopping Binzel on the street to chat when he’s wearing his New Horizons shirt. “Somehow in the Internet generation or the Twitter generation or whatever this is, this has just been a lightning bolt,” said Binzel. Binzel was a key member of a group that began proposing the NASA-funded, $700 million mission a quarter-century ago, and suffered its cancellation six times before finally seeing it launch in 2006. By 1989 the best available telescopes and instruments had reached a dead end in studying Pluto from Earth. 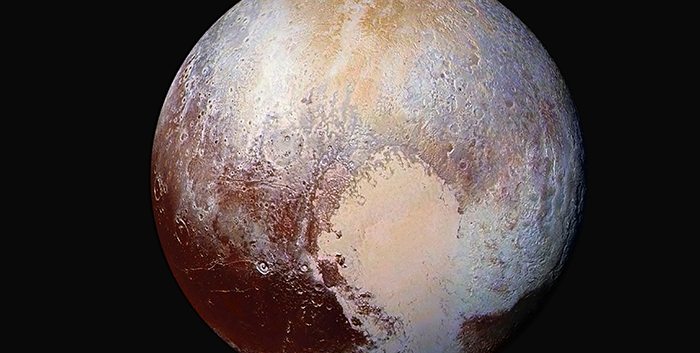 The only way to learn more about the dwarf planet and how it formed was to go there. And after a nine-and-a-half-year journey, New Horizons has delivered on that promise, confirming with great accuracy observations that were made decades before, and revealing scientific surprises beyond the imaginations of investigators. It will take a year for the data collected to finish transmitting back to Earth, but early results have shown Pluto to possess a surface full of stark contrasts that may be caused by seasonal variations throughout its 248-year elliptical orbit around the sun—potentially very complicated ones. “On a planet 3 billion miles from the sun that we would expect to be just frozen and inert, we see instead what what seems to be one of most active places in the solar system,” Binzel said. The evidence? New Horizons’ discovery of an incredibly bright, white, and flat ice plain known as the Sputnik Planum amid Tombaugh Regio, the heart-shaped mountain range named after Pluto’s discoverer, Clyde Tombaugh. The ice plain “looks entirely crater-free—it looks very young and very fresh, and it is the freshness of the ice sheets that has us all astounded. Because they are so fresh, there has to be some recent process to create them,” he said, and that could place the birth of Sputnik Planum a million years back, a century back or a week back. Work with Massachusetts Institute of Technology graduate student Alissa Earle could result in a viable hypothesis about the plain’s origin within two or three years, said Binzel, who wasdelighted to have Earle on the team (as well as pleased to anticipate a doctoral thesis from the work) because she’d been working on sunlight insolation predictions for Pluto more than a yearbefore the first New Horizons datum arrived, making her ideal to also explore the questions of sublimation of its ice. 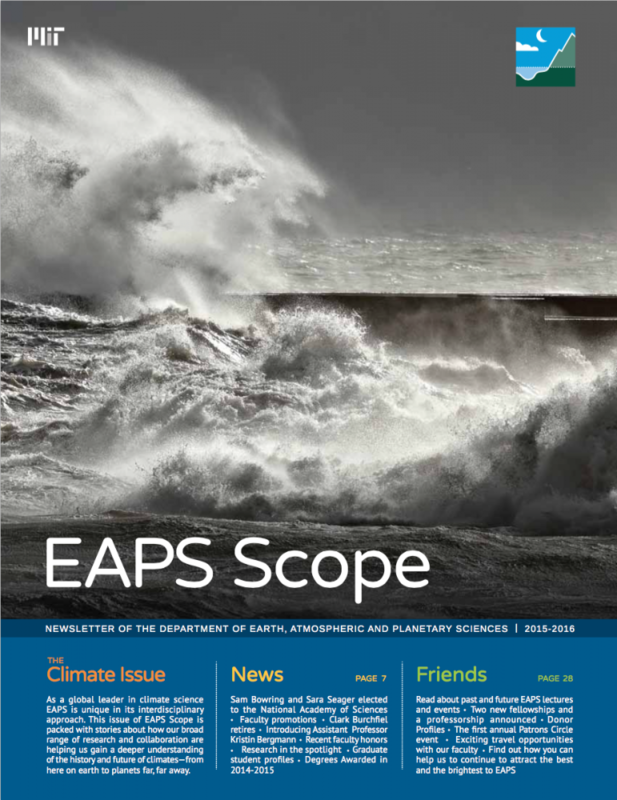 “To watch EAPS students and former students become mature scientific leaders in their own right is the highest professional satisfaction I have ever experienced. It’s the students and how they’ve soared that is the real highlight,” Binzel said. That applies not just to Earle, reflecting passage to a next generation, but a continuum with the past: the scientific leaders Binzel referred to include Leslie Young and Cathy Olkin, EAPS doctoral graduates from 1994 and 1996, respectively, who now are two of the top deputy project scientists on the New Horizons mission and proteges of the late EAPS Professor of Planetary Astronomy James Elliot. At a private dinner Binzel hosted for close friends of EAPS in September, including Elaine Elliot, Jim’s widow, Binzel announced a team proposal to name one of Pluto’s most prominent craters after Elliot, who died in 2011. Additionally, plans to name a graduate fellowship in planetary sciences in honor of Elliot have also recently come to fruition. An additional joy for Binzel has been “seeing the look on the faces of colleagues with whom I’ve worked on this for so long, especially those who have been so much more deeply in the trenches,” Binzel said. While a team assembled and led by principal investigator Alan Stern will continue an extended mission through the Kuiper Belt, hoping to use the remaining fuel budget to scrutinize at least one known object about 50 kilometers across, there’s also an acknowledgement that New Horizons already has a solid place in history: as the capstone for the generation completing the first reconnaissance of all the planets in the solar system, closing a tidy 50-year circuit since Mariner 4 first flew by Mars. Will that achievement stick with the children listening raptly from the carpet of the Lexington Public Library? “I guess we’ll find out when we quiz the entering class of 2030 about how they got interested in their careers,” Binzel said.